So as a Texan, I take a lot of heat for not being a Cowboys fan. How can you live at close to Dallas and like the Steelers? Are you from Pittsburgh? Is your family from Pittsburgh? How can you like the Steelers?! Dallas is America's team! Well the story is pretty simple and a little embarrassing. So I'm going to tell you but don't spread it around. 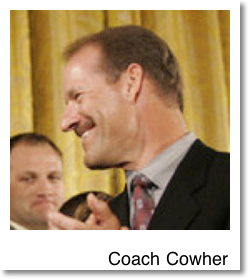 My love of the Steelers is all Coach Bill Cowher's fault. How can it be his fault? Well back in the day, my family lives out in the booneys, the sticks, BFE, you know out in the middle of nowhere. My parents could not afford a satellite so we were had one channel, ABC, which meant watching Monday Night Football. I was not a football fan but it was noise so we had it on. One day the Steelers were playing and they showed Coach Cowher on the screen. My first thought: Sgt. 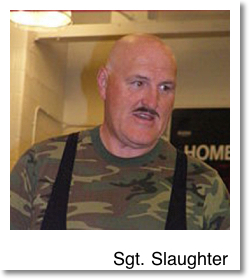 Slaughter! That's all it took, seriously, I've been a Steelers fan since. I've come a long way from those days under DH's tutelage I've learn I made a smart choice. My tram is awesome. I can talk football with the guys and even make some smart calls. I own a terrible towel, which I bought in Virginia Beach, VA. I have my very own Troy Polamalu jersey. Love me some Troy on the field. Love watching him bring people down and stripping people of the ball, so hot. He is my top freebie. So in short the Steelers became my team on a fluke and the need for glasses. The Groom is a huge Steelers fan; he wore a Steelers tie to his wedding. Really before the Steelers '06 super bowl win, I didn't let the Groom know I liked the Steelers; it was just too much fun to tease him. 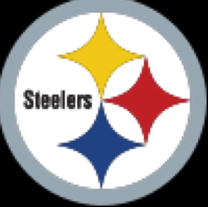 Yes I am a member of Steeler nation and yes I love in Cowboy country and no I don't mind.